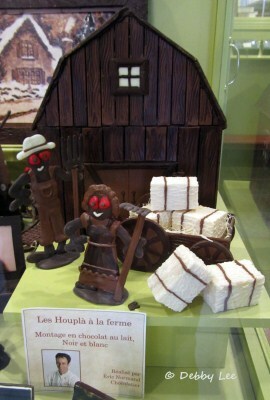 Yes, there is a chocolate museum in Québec City! Yes, it is a place where there is endless delicious chocolate. My kind of place! Located on rue Saint-Jean, a short walk from Old Québec, and “your Québec City chocolate maker since 1988,” I visited this museum (and store!) three times. Yes, three! 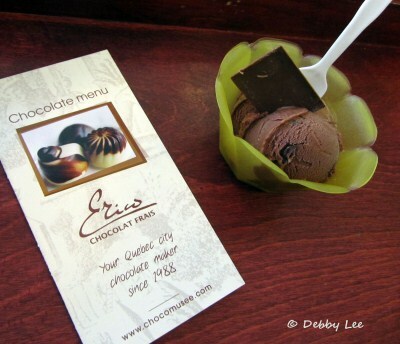 The first time I went to Érico Choco-Musée it was closed. But that didn’t matter. 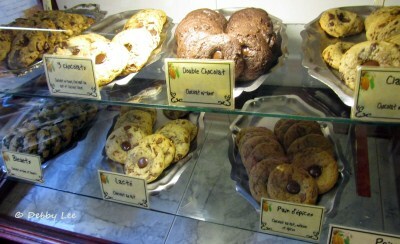 At least I became aware of its existence, and was able to drool over the window displays of items made out of chocolate. During my tour of Québec City, my wonderful guide, Sharon, and I discovered that we both love chocolate. Had this museum-store been open when she showed me this place, we would have had some of their home-made ice cream. Instead as we continued on with our tour of Québec City, I made a note-to-self that I needed to come back here later. Therefore at the end of my tour, I actually had Sharon drop me off right in front of Érico Choco-Musée. My second visit. I went straight for that ice cream. Before lunch, in fact. I indulged in a “three chocolates” flavor. Dark, milk, and white – with chunks of chocolate. Mmmmmmm. After enjoying my pre-lunch appetizer, I walked around the one-room museum, which is next to the store, full of so much information on chocolate that I was amazed. History of chocolate from the Mayan’s time to today; chocolate-making techniques and process (from the cocoa bean to the chocolate bar); secrets of artisan chocolate making; and a collection of 200 antique chocolate-related objects, including items originating in Mexico, the Caribbean Islands, Europe, the U.S. and Canada. You can also observe the artisan chocolate making process through a window overlooking the kitchen where they make their chocolates right there. 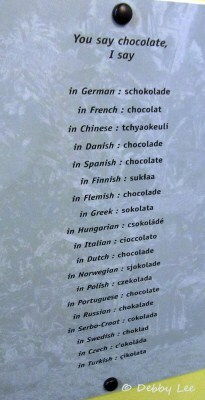 I even found a list of how to say “chocolate” in 19 languages – it is good to know that other than in China and Finland, I can easily recognize chocolate! “Exotique” – milky ganache with caramelized banana. “Belge” – hazelnut and coffee crème fraîsche with walnuts. “Truffle Sésame” – extra-bitter ganache, tahini, roasted sesame seed oil. “India” – bitter-sweet ganache with coconut milk, mangos, lime, Indian spices. “Fleur de Lavande” – white chocolate with lavender flowers and honey. “Cappucino” – bitter-sweet ganache with Italian Espresso coffee. “Alizé- white chocolate ganache with passion fruits and Alizé liquor (Cognac and passion fruits). I went back the next day for my third time. I couldn’t resist. I absolutely needed to try their double chocolate cookie (can you tell I love chocolate? 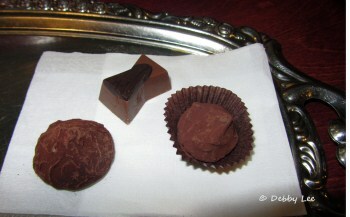 ), and three samples of their tiny chocolates (elegantly served on a silver tray). I also needed to bring back home for my boyfriend three samples of their chocolate bars, one flavored with cardamom, another with Chipotle pepper, and one made with Jamaican chocolate. Mmmmmmmm. Oh, there’s free admission to the museum. Which is great because no doubt you’ll spend your money on chocolate in the store. But definitely worth every Canadian penny! Check out the Érico Choco-Musée website, there’s more. And more. And more. Even chocolate recipes. 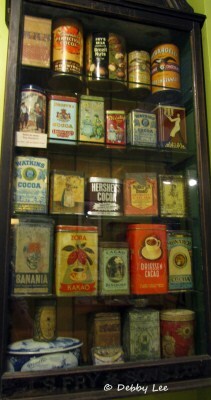 A list of chocolate museums around the world. And an explanation of the health benefits of dark chocolate (when consumed in moderation). Their Chocolate Menu brochure that I picked up there says, “Delivery service available.”…To Seattle?? Sweet (and I mean, sweet) Travels! This trip was provided to me courtesy of Montréal Tourism, Québec City Tourism, and VIA Rail Canada, which brought me from Montréal to Québec City (links to all below). Thank you to Sharon Frenette, my tour guide, who introduced me to Érico Choco-Musée. 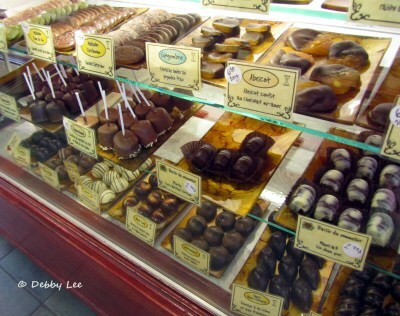 This entry was posted in Chocolate, Montréal and Québec City and tagged Chocolate, Montréal and Québec City by debbysdepartures. Bookmark the permalink. We must be related! Sounds divine! In addition to my first written travel book on the SWCP, I have also created my favorite subject to photograph when I travel - windows and doors - into six books, including places from the Cotswolds to the Camino, from Île d’Orléans to Porvoo in Finland, lighthouses in Michigan, and ten other various countries including Bhutan. Who knows, I may even create a book with windows and doors pictures along the SWCP. All books are available on Amazon.com, Amazon.co.uk, and other Amazon channels, with links below, with the written book on the South West Coast Path available in both paperback and eBook versions. There are brief descriptions of each book on my "Windows and Doors Travel Photography Books" page and on the "Written Book - "The Arrow Closest To The Acorn" - South West Coast Path" page. Please feel free to contact me at debbysdepartures[at]yahoo[dot]com. As I say at the end of all my blogs, Sweet Travels! Unless specifically mentioned, all images on this Debby's Departures blog, and my previous blogs on the Wanderlust and Lipstick website (both as 'Debby's Departures' and 'Tea, Sugar, a Dream,'), are my own original photographs and therefore are copyright protected (©Debby Lee, Debby Lee Jagerman, Debby Lee Dungan, or Debby Lee Jagerman-Dungan). Feel free to use my images for non-commercial use so long as you give me credit and let me know via email. Likewise, feel free to pin my images to Pinterest, but please mention me by name. For all inquiries, please contact me at debbysdepartures(at)yahoo(dot)com. Thank you. Sweet Travels! Copyright © 2019 Debby's Departures All Rights Reserved.